Choosing a skip hire company to take care of your domestic waste is not easy. Fortunately, Skipgo Vaal does all the hard work for you. When dealing with small amounts of household waste or garden waste, mini skip hire is perfect. Mini skip hire is usually fine when re-decorating, doing minor building work or removing lots of garden waste, such as soil, turf and felled trees. For smaller amounts of domestic waste, there are some good alternatives to skip hire, and you may be able to cope with something smaller like a 'mega bag' or one of the many other options we have. Simple garden maintenance, particularly in spring and autumn, such as mowing the lawn, pruning shrubs and trees and weeding flower beds can amass more waste than your ordinary domestic bin can cope with. If you’d rather avoid the hassle of transporting black bags full of messy garden rubbish too and from your local recycling center by car, hiring a skip is a quick, convenient and cost-effective alternative which makes the process of garden rubbish clearance so much easier and less time-consuming. For this, you need our 2 cubic meter skip. For larger garden projects such as tree removal, lawn-returfing, shed clearance and minor garden building works a skip is indispensable. Where significant amounts of garden waste are likely to be generated it’s a good idea to hire a skip that’s slightly larger than you think you’ll need for your garden rubbish clearance like our 3 cubic meter skip. Home renovations can not only transform your day-to-day living space for the better, giving your home a new lease of life but they can also add significant value to your property. Whether you’re converting loft space to create an extra room, replacing that 1970's avocado bathroom suite or giving your kitchen a much-needed face lift, there’s a great deal of pride and satisfaction to be taken from successfully completing your own home renovation projects. However, home renovations create lots of waste material which needs to be disposed of responsibly and ethically. So how do you collect and get rid of those old kitchen cabinets, bathroom fixtures and fittings or boxes of junk that have been gathering dust in the attic for years? A skip is the best solution for dealing with home renovation waste. Transporting your own waste to the nearest recycling center is both impractical and time-consuming; if you only have a car and you’re replacing a bathroom suite you’re likely to have to incur the expense and inconvenience of hiring a van just to dispose of your old bath. Of course, you could hire a man-with-a-van to collect and dispose of all of your home renovation waste, but again you're reliant upon their availability and reliability, and if your waste is of sufficient volume that it requires several trips to dispose of, you may be looking at significant costs again.The practical and cost-effective way in which to deal with waste from house renovations is to hire a skip from SkipGo Vaal. Arranging skip hire is quick and easy, click here. Your skip will normally be delivered within 24 hours, and sometimes even the same day, leaving you free to concentrate on your home renovation whilst having somewhere convenient to dump any messy waste materials as and when they’re produced. 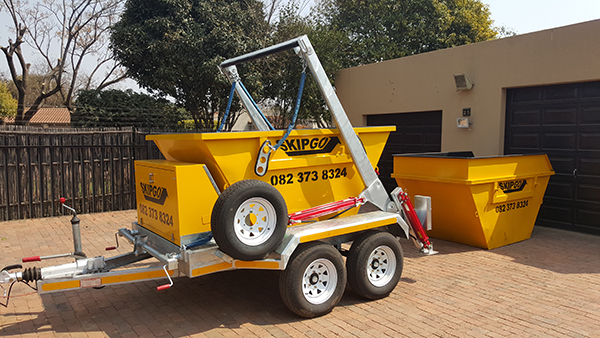 Once your home renovation project is finished, you simply call SkipGo Vaal and we will collect your skip and dispose of the contents responsibly. With budget skip hires in the Vaal Triangle residents can remove all sorts of rubbish types in the one skip. Just skips for green waste or just skips for the earth is something SkipGo Vaal doesn’t have. There is just one skip type, so you can throw away any rubbish you have* leaving the size for you to work out. A bit too much rubish or rubble?The complex you live in won’t let the big trucks in?